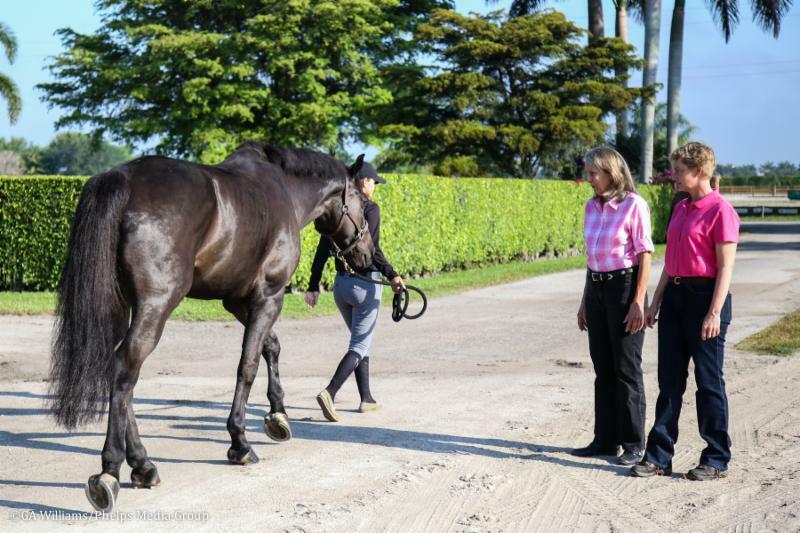 Wellington, FL - Jan. 21, 2016 - Wellington Equine Sports Medicine's veterinarians Anne Moretta V.M.D. M.S., Suzan Oakley D.V.M., Dipl. ABVP (Equine), Certified Member ISELP, and renowned rehabilitation professional Sheila Schils, Ph.D. M.S. agree that muscular issues that cause performance challenges in the equine athlete are often overlooked. Horses have proportionally greater muscle mass than humans, with muscle tissue comprising up to 60 percent of their bodyweight, so it stands to reason that muscle problems can have a profound impact on performance quality. Drs. Moretta and Oakley observe a horse during a performance evaluation. If a rider has muscle aches and pain after a busy day of schooling following a period of time of riding inactivity, our equine partners must certainly have similar discomfort. Muscle pain, exercise intolerance, muscle atrophy, weakness or stiffness can be signs of muscle problems. The diagnosis of muscle disorders can be elusive, causing frustration for the owner and challenges for the veterinarian. Since muscle injury can accompany and/or mimic skeletal problems, tendon or ligament injury, or even neurological disease, diagnosis can be complicated. The best way to prevent muscle problems is to maintain your sport horses in regular, individually tailored conditioning programs designed and updated by Drs. Moretta, Oakley and Schils at Wellington Equine Sports Medicine. These programs will help avoid working your equine partners beyond their level of conditioning which can create more long-term lameness issues. Consistent feeding programs can be implemented based on each horse's level of fitness and energy requirements to avoid metabolic problems such as myositis and 'tying-up'. Dr. Schils uses Functional Electrical Stimulation (FES) to improve neck muscle function. "It is very important to evaluate the horse's overall muscle development, " said Dr. Oakley. "Identifying areas of muscle atrophy can help with the diagnosis of musculoskeletal problems. Compensation for pain in one area can result in muscle spasm, local pain, and muscle atrophy in other areas." Primary muscle disorders include acute or chronic muscle injuries, Exertional Rhabdomyolysis (tying up), Hyperkalemic Periodic Paralysis (HYPP) in Quarter horses, Equine Polysaccharide Storage Myopathy (EPSM) and other glycogen disorders. Systemic disease such as Equine Protozoal Myelitis (EPM) and Cushings disease can cause muscle atrophy as well. Shivers is another disorder affecting muscles that may have a neurologic origin. "Assessment of suspected muscle problems should begin with a complete professional performance evaluation. Some of the parameters that we check for are any changes in behavior, acute or chronic lameness complaints, changes in body condition, any comments by the rider or trainer regarding under saddle performance or training difficulties." Dr. Moretta said. "The complete physical and lameness examination can include, diagnostic imaging as well as blood work or muscle biopsies for metabolic or genetic disorders (Insulin Resistance, EPSM, HYPP or Myositis) as underlying sources of pain. I find acupuncture and electro-acupuncture are very useful in relieving muscle spasm, reducing muscle inflammation, and controlling pain related to muscle dysfunction. I also use equine spinal manipulation to aid in restoring normal nerve function to atrophied muscle groups, reduce muscle spasm, and help restore normal bio-mechanical movement." Muscle spasms and atrophy are very common in the neck and back. Functional Electrical Stimulation (FES) is a useful therapeutic option to improve muscle function. Dr. Schils states that "Due to the ability of FES to replicate symmetrical muscle function, the technology can be used to improve the balance of the horse. Once the horse is in an ideal balance, injuries are less common and performance is much more consistent." In addition, with the use of FES, muscle spasms, as well as muscle atrophy will be reduced making the horse more comfortable. Contact the professionals at Wellington Equine Sports Medicine for a performance evaluation if you have concerns about muscular issues. They can help get your horse on the right track with an accurate diagnosis, appropriate treatment program, and individual follow up with rehabilitation therapy. Rehabilitation is a critical step which is often ignored with our professional equine. WESM wants to keep your equine athlete performing at its best. 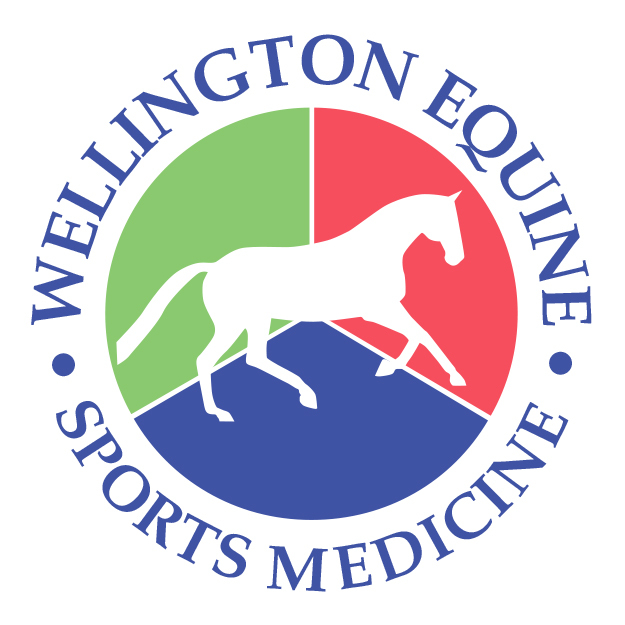 Wellington Equine Sports Medicine is official veterinary practice at The Ridge. For more information about The Ridge at Wellington, click here. At Wellington Equine Sports Medicine, Anne Moretta, V.M.D., M.S. and Suzan Oakley D.V.M., Diplomate ABVP (Equine), a certified member of The International Society of Equine Locomotor Pathology (ISELP), both distinguished equine veterinarians, educators and past presidents of FAEP work alongside equine rehabilitation professional Sheila Schils Ph.D M.S. 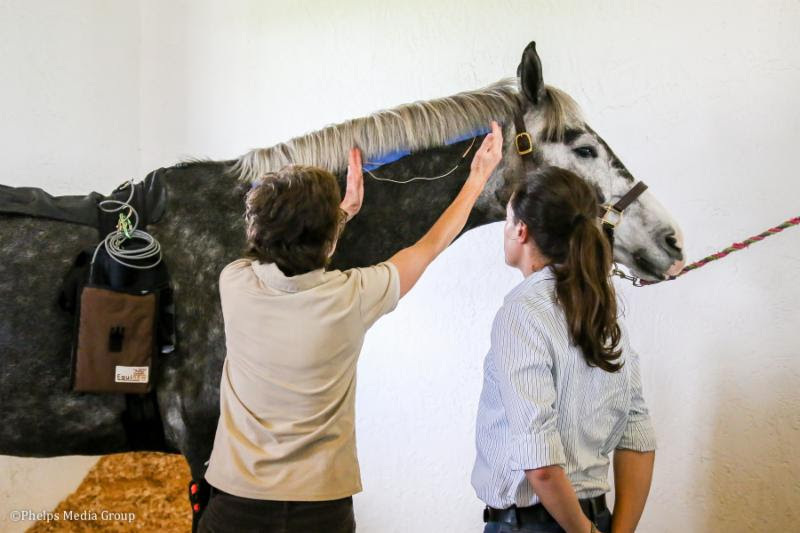 The Wellington Equine Sports Medicine team evaluates the entire horse with innovative approaches and technology to resolve underlying lameness or performance issues. Their team philosophy provides a cohesive treatment plan from initial diagnosis and selection of the latest treatment options to the development of rehabilitation protocols using individually tailored steps in equine care.